DCAU Comics » To Live and Die in Gotham City! A young man, Giovanni, steals bread and cheese from a corner grocer, taking it to his new friend Bane. Giovanni found Bane after Thorne’s goons beat Bane, shortly after Bane’s defeat at the hands of the Batman. Giovanni has been helping Bane kick the drug Venom. Bane wants revenge on Thorne, and the two prepare a plan. Together, they kidnap Thorne and his assistant Candace after a night at the opera. Thorne’s disappearance sets the city’s underworld on edge. Batman and Robin scour the city for clues, when Bane finds Robin alone. Bane declares he has no desire to fight, and leaves an address where Thorne can be found. When Batman and Robin arrive, Bane threatens to kill Throne. 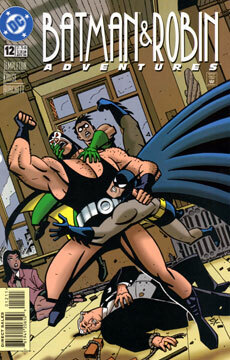 While the dynamic duo race to the seventh floor, Giovanni pleads with Bane not to kill anyone. Ultimately, Giovanni saves Throne by hitting Bane with pipe from behind. Batman and Robin then burst in, and take down Bane. Bane declares he has no friends and has been betrayed by all. This is a nice follow up to the first Bane episode. Like so many stories following Bane’s introduction as a character in 1993, it concerns Bane’s efforts to quit his addiction to Venom. Given that this was a kid’s comic book almost twenty years ago, the subject matter was handled with grace. I commend Mr. Templeton for that. As for the rest, it’s a decent tale that I enjoyed reading. Kruse and Burchett deliver the goods again. It’s not the best issue in terms of accuracy to the characters, but it serves. Thorne’s faces stands out as particularly well rendered. This takes place shortly after “Bane.” In the issue, Bane kicks his Venom habit. But I seem to recall he uses it again in “Knight Time,” so maybe he had a relapse. If that’s the case, then this fits in just fine. Not particularly, though why Bane has no pants on the cover is beyond me. One Response to To Live and Die in Gotham City!